Want brighter, whiter teeth that will make you look amazing and years younger? In just 1 hour you can get dazzling white teeth with a professional teeth whitening treatment in the Manhattan cosmetic dentistry office of Dr. Michael J. Wei. Professional teeth whitening is non-invasive, which should please even the most anxious of dental patients. 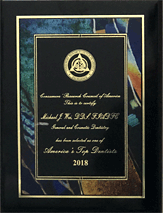 A teeth whitening treatment from your Manhattan cosmetic dentist is far more effective and longer-lasting than over-the-counter whitening treatments. In just one hour your teeth will be dramatically whiter and brighter. Professional whitening treatments are safe and painless. Even if they’re misaligned or gapped or overlapping, even imperfect teeth look more perfect with a whitening treatment. It cannot be disputed that whiter teeth have the capability to make you look younger, happier, healthier, and even smarter. Even if you don’t have time to spare one hour in your Manhattan dentist’s office for a professional teeth whitening treatment, there are take-home teeth whitening options available. You can lighten and brighten your teeth on your time in the comfort of your own space with the same amazing results. Whether your existing tooth stains are from medication, diet choices, beverage choices, poor oral hygiene, smoking, or otherwise, a teeth whitening treatment is often the easy and fast solution. However, it is necessary for your Manhattan cosmetic dentist to determine exactly what types of stains you do have on your teeth before proceeding with a whitening treatment. The goal is for your cosmetic dentistry treatment to be as effective as possible and, in some cases, tooth discoloration cannot be reversed by teeth whitening. If the stains are intrinsic, meaning they are inside the tooth, whitening will not penetrate the discolored areas. Some teeth develop stains because of antibiotics. Aging is another symptom of tooth discoloration. Other patients simply have naturally thin tooth enamel that makes their teeth look yellowish and that tint cannot be altered by a whitening treatment. If you do have intrinsic tooth stains, you aren’t destined to a future of unsightly teeth – other cosmetic dentistry treatments will be recommended to correct your oral health complaints, such as porcelain veneers or Cerinate Lumineers. Now, if your teeth are exhibiting extrinsic tooth stains, which are on the surface of your teeth, then a whitening treatment will be your saving grace. Maybe you have a love of coffee, dark sauces, dark berries, or red wine. It’s not actually the foods themselves that cause the stains to your teeth, but the acidity in the foods and drinks that erode tooth enamel. This makes teeth more susceptible to staining and, over time, discoloration will occur, especially if you do not have excellent at-home dental care and neglect to keep up with your twice annual dental cleanings and exams. In-Office Teeth Whitening: The in-office teeth whitening treatment is hard to beat. In just one quick and convenient hour, the Rembrandt Sapphire Teeth Whitening system will turn your teeth from dingy, brown, gray, yellow, or stained to dazzlingly bright white. Also available: Opalescence Boost Whitening from Ultradent (no light needed) and the powerful KOR Whitening. Your smile will actually sparkle, and people will notice – in a good way. During the treatment, you needn’t do anything but think of how stunning you will look at the finish. Want to zone out? Feel free to take advantage of our flat-screen television with noise-reducing Bose headphones for your entertainment. 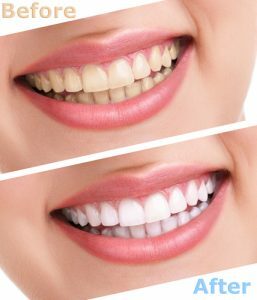 Zoom Teeth Whitening: Also an in-office whitening treatment, the well-known Zoom Whitening has the ability to make teeth up to eight times whiter in about an hour. Gums and soft tissues are protected by cotton rolls and cheek retractors, while desensitizing gel is applied to ensure that your mouth does not react to the powerful bleaching agents. Once the whitening treatment is applied to teeth, a laser light is focused on your teeth and programmed to do its work. And fine work it is indeed – Zoom whitening is popular for good reason. This procedure is effective, fast, and long-lasting. Take-Home Teeth Whitening: If you truly don’t have an hour to spare to sit in the dentist’s chair and have your teeth whitening treatment professionally applied, there is the take-home teeth whitening option. This method rivals the results of the in-office teeth whitening, but the at-home kit does require two weeks of treatment. If you’re all-in, Dr. Wei will create a mold of your teeth so that your whitening trays will be customized to fit you perfectly. You will be provided with bleaching gel as well as desensitizing gel (so there is no discomfort on the teeth and gums), and from there you are on your own to follow the application instructions. Done properly, the take-home teeth whitening treatment can last for up to two years. Allow Dr. Wei to help you choose the right and best whitening treatment for your smile! Tooth stains are incredibly common. Your teeth do a lot of work day in and day out. Eventually, the wear and tear will start to show. Tooth stains can vary – some are far more deep than others, but that doesn’t mean a whitening treatment can’t be effective. Truly, there is a teeth whitening solution for every patient. Professional one-hour teeth whitening may not be the best treatment for you, but a whiter smile is absolutely attainable, no matter what kind of oral health you have now. With the right steps and the best Manhattan cosmetic dentist at your side, your smile will look amazing, sooner rather than later. Schedule your consultation with Dr. Wei so he can present you with the teeth whitening solutions that are viable for your oral health. Together, you can decide what option is best for your smile. An exam will precede any treatments, to ensure that your oral health is in good condition to receive a whitening treatment. 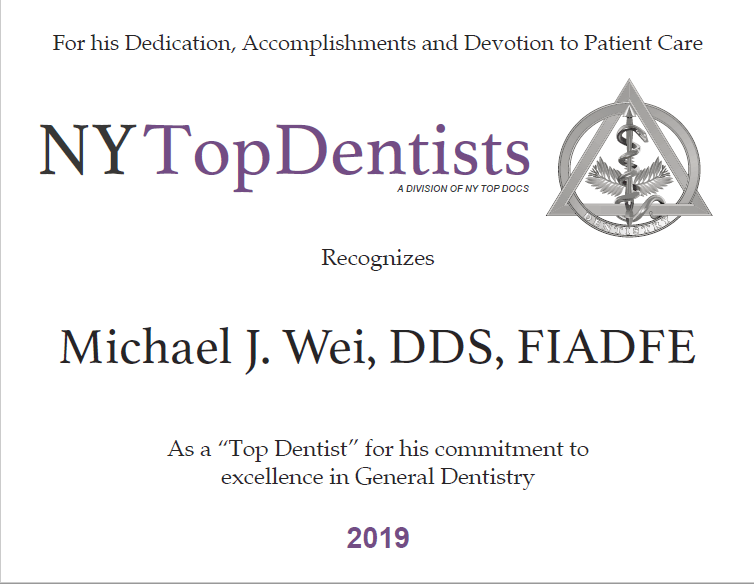 Barring any complications with your teeth or gums, Dr. Wei will create a custom whitening solution for your needs that will be incredibly effective and life-changing. 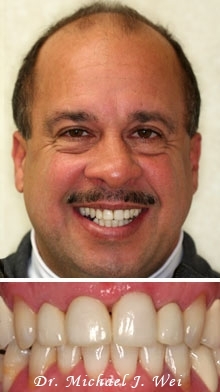 Your confidence and appearance will change drastically thanks to a teeth whitening treatment. One hour, major benefits – there are no down sides to a professional teeth whitening treatment from your Manhattan cosmetic dentist. Ralph was concerned of his dark, stained, fractured, upper front teeth. He never liked his upper front teeth and was always embarrassed to smile. 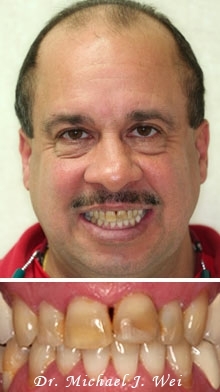 He wanted a nicer, whiter, and brighter smile without spending too much money. By using 2 Porcelain Veneers, 2 Porcelain Crowns, and Teeth Whitening we were able to give him a whiter and brighter smile he is proud of. Get the latest news about teeth whitening. Read the latest testimonials from actual teeth whitening patients. Watch videos from satisfied teeth whitening patients of Dr. Wei.